If you’re in the market for new flooring, you’ve discovered that the question is a bit more complicated than laminate or hardwood these days. There are so many choices! In our search for new flooring, we automatically ex-nayed hardwood due to costs and were left looking at laminate, wood-look tile, and Luxury Vinyl Tile aka Luxury Vinyl Plank (LVP). After doing lots of research, we finally settled with Luxury Vinyl Plank. 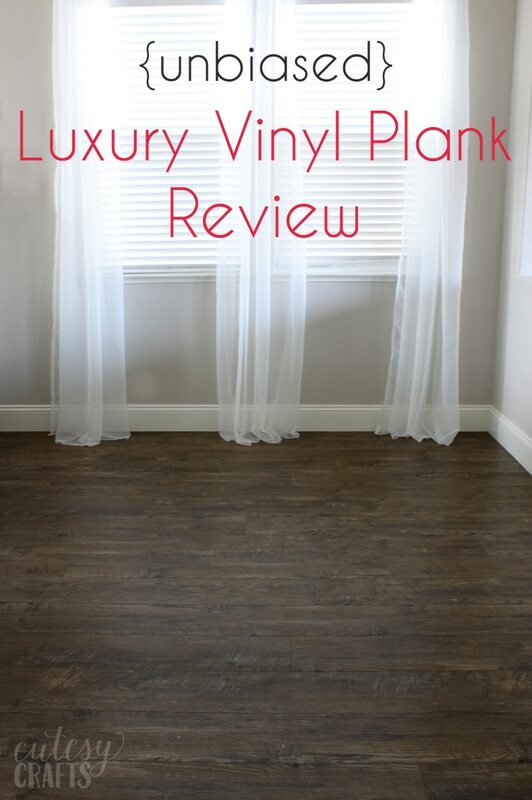 Since there isn’t a lot of information out there yet, I thought I would give you my unbiased Luxury Vinyl Plank flooring review to help make your decision easier. This is just my experience with the flooring. Please do your own research and come to your own conclusions. I am not liable for any decisions that you make for your floor or home. Make sure to also read my post about Things you’ll need to care for your Luxury Vinyl Plank Flooring and read my Vinyl Plank Floor Review – Two Years Later to see how it’s holding up. waterproof – Unlike laminate, LVP is completely waterproof. You don’t have to worry about a dishwasher leaking, kids spilling, or pet accidents. As a mom of four, a waterproof floor in the kitchen is very important to me. My kids are constantly spilling water, and I don’t find it until I step in it a couple hours later. I didn’t want a floor that I would have to worry about all the time. cushion – We lived with the concrete foundation as our floor for two months, trying to figure out what to do about some issues we had. Standing and walking around on the concrete really started to do a number on my feet and joints. I know, I sound like an old lady, but it’s true! I am so glad that we didn’t end up getting tile because I would have been dealing with that all the time. My LVP was installed with a nice, cushy underlayment. It’s also a LOT warmer than tile would have been. That makes a big difference in the winter. ease of installation – Since LVP clicks together like laminate, the installation process is fairly simple. If you are an ambitious DIY-er, it’s something that you can do yourself. We opted to have ours professionally installed. Since it’s easy to install, that also helped keep professional installation costs down. On average, the installation quotes that I got for LVP were $2.00/sf and wood-look tile was upwards of $6.00/sf. That makes a HUGE difference when you are talking 1200 sf of flooring. ease of UN-installation – I know it’s not something that you want to think about when you are spending so much money on new flooring, but someday it’s going to be out of style. That’s just the way things are. 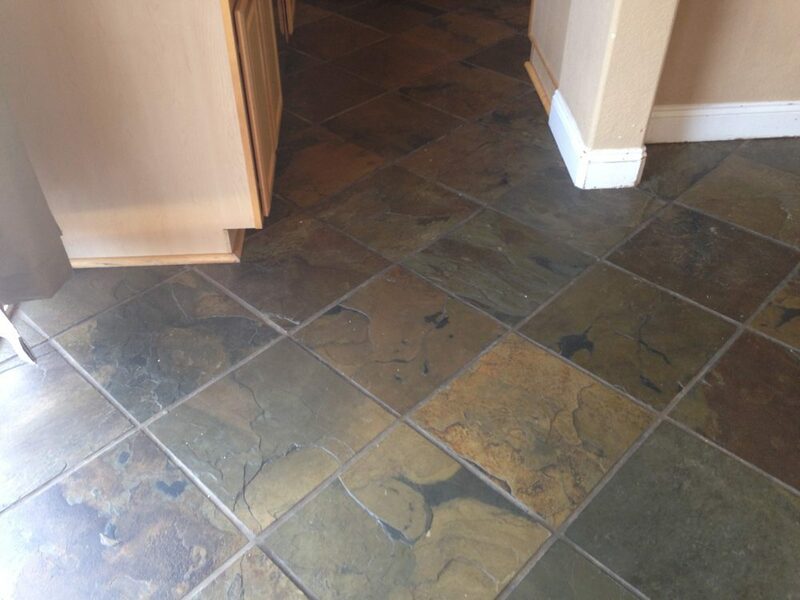 When we bought our house, there was dark slate tile all throughout the kitchen and other places downstairs. It was a huge pain to demo all of it! We got quotes for $3.00/sf just to get it taken out. Wood-look tile might be a hot trend right now, but how long is that really going to last? I can’t image what demoing an entire first floor of tile would have been like. Here’s a nice “before” picture for you. What a difference some paint and new flooring can make! scratch resistance – I brought home lots of different flooring samples before choosing one. When comparing the laminate and LVP samples, I took a screw driver and attempted to scratch the surface of both. The laminate that I tested was a good quality, water resistant laminate, but it scratched a lot easier than the LVP. Not all LVP is the same though, so make sure to do your research. The stuff we chose is commercial grade and has a high wear layer. I did have some scratches appear from my son’s ride-on car, so it’s not completely scratch proof. You’ll still need to put pads on your furniture and stuff. We ended up cutting socks and putting them on the wheels of my little one’s car. high moisture tolerance – I told you recently about the new house we bought and alluded to some of the issues we had. 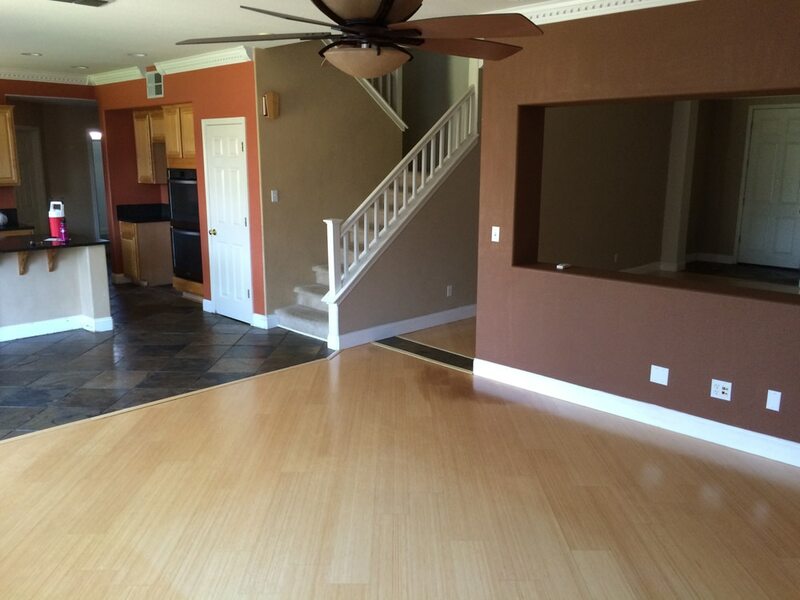 The day we closed escrow, we decided to pull up the old bamboo flooring and found lots of mold growing beneath it. We discovered the mold was caused by high levels of moisture in our concrete slab foundation. The original plan was to go with laminate flooring throughout the first floor, but with the high levels of moisture, we had to consider other options. The LVP that we chose can handle up to 9 lbs/1000 sf of moisture in the foundation, whereas traditional laminate can only handle up to about 4 lbs/1000 sf. This also means that it’s a good option for things like basements and finished garages, where moisture levels might not be ideal. not as realistic – Luxury Vinyl Plank is a far cry from sheet vinyl, however it still doesn’t look and feel as real as laminate flooring. 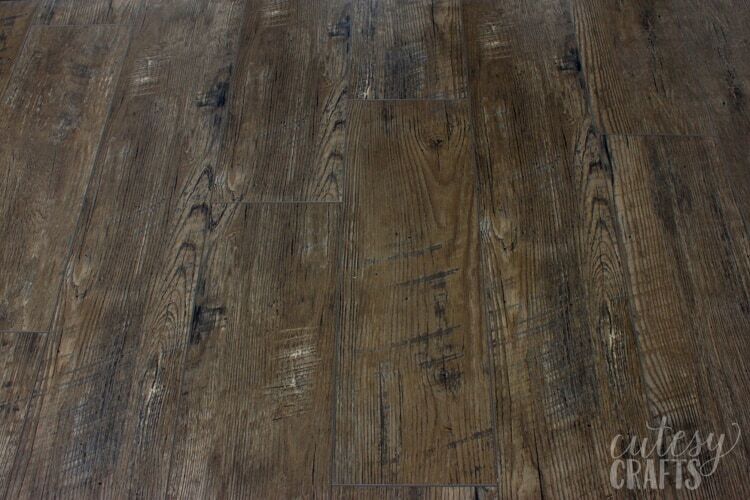 I chose a very high quality LVP that has a nice wood grain texture and separations between the boards. Most people that come to my house aren’t really sure what it is and ask if it is tile. They are shocked to learn that it is actually vinyl. When you look at it from a certain angle and light, the wood grain texture does look a little fake, but no more fake than the wood-look tile that is super popular right now. cost – Depending on what kind you get, LVP does cost a bit more than laminate. The laminate we were looking at cost about $2.00/sf, whereas the LVP was more like $4.00-$5.00/sf. That was the main reason we originally chose laminate flooring, but the moisture levels in our foundation stopped us from going this route. In the end, I’m so glad we went with this flooring, and I hope this Luxury Vinyl Plank flooring review was helpful. Not having to worry about scratches and spilled drinks makes it all worth it! It may not look and feel as realistic as laminate, but when it comes down to it, no one is going to be looking at your floor that closely. The overall look is beautiful, and the contractors were even commenting on what a wonderful, high-quality product I had chosen. The brand of flooring we chose was Paradigm, style: Longboard, color: Mavericks. I haven’t researched all of the LVP options out there, but I also looked at what seemed to be nice quality ones from COREtec at RC Willy. I recommend getting samples of several brands. Bring them home, test them out, and really get a feel for which one you like. Paradigm doesn’t really have a way to contact them, and now their retailer list is gone off their site. That’s a little concerning to me, so make sure to do your research. Oh, and if you’re wondering about the high moisture levels in the concrete foundation, we finally found out what was causing them when we had our first rain of the season. Turns out the yard has horrible drainage issues and becomes a lake every time it rains. The one corner of the house that had the highest level of moisture and mold is right where the water was pooled next to the foundation. If you are reading this because you have similar issues, I wrote up a post about what we discovered while dealing with the problem. You can find that here. I know how frustrating it can be to deal with this, so I’m hoping that telling our story will help someone. 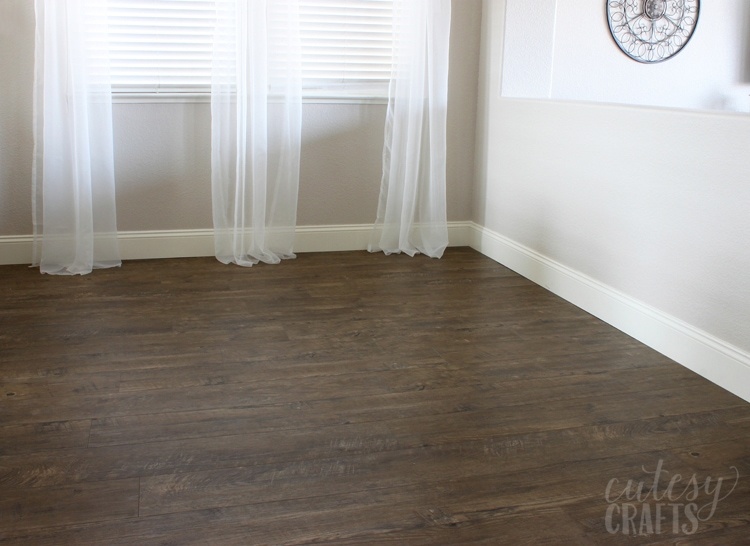 If you are curious to see how my floor is holding up, take a look at my updated Vinyl Plank Floor Review – Two Years Later. 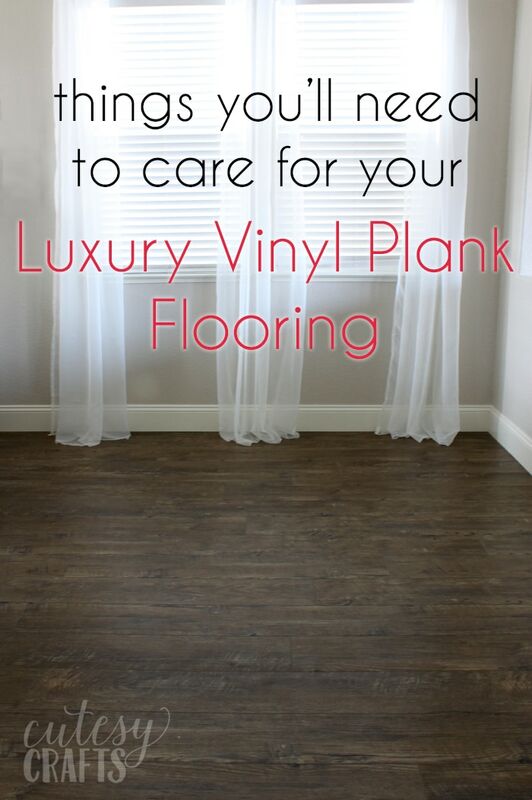 If you end up getting LVP or other hard flooring installed, check out my other post about Things you’ll need for your Luxury Vinyl Plank. Thank you! I’ve been looking everywhere for personal reviews of LVP. We are building a rental unit, and the waterproof factor is a big one for us. Would you mine telling me the specific product you used? We like that look, and definitely want a high quality commercial level product. So glad you found the review helpful! I ran into the same problem… no good reviews! The flooring we used was Paradigm Longboard in the color Mavericks. I love it so much! If you go to Paradigm’s website, you should be able to find a list of retailers. There are also some selling it online. Just be careful to inspect each piece as we did find just a couple with defects in them after they were already installed. :\ We also found some nice LVP at RC Willey, but I didn’t take the time to research the quality on those ones. Hope that helps! Another huge “thank you”! I will be replacing flooring in a 1700 sf rental and was going to install Pergo or a similar laminate. Never heard of LVP until a wholesale floor guy showed me. Really appreciate a personal review. You are so welcome! I’m lad you found the review helpful. We are still loving our floor! We’re looking to replace our entire downstairs, stairs, and upstairs hallway bathrooms and laundry room. We bought a box of the flooring we liked best so we could lay it out and see/feel it in the room. The main issue I have is that it seems “clacky”when the dogs walk on it. I’m also missing the bevel that we have in our existing wood (that is trashed because of the afore mentioned dogs and kids). So, after living with it, do you feel like it feels and sounds plastic-y?? This is such a big decision that I know I’ll have live with for a long time, I don’t want to make a mistake and hate it…. It definitely has a more plastic-y feel and sound than laminate and hardwood. I only really notice it when I tap or drag my fingernails across it. The one that I got is better quality than a lot of them that I looked at, so it’s not as bad as some. That was what initially turned me off to vinyl too, but I’m glad that we went for it. I love that I don’t have to worry about the kids spilling things or dragging their toys across the floor. Maybe I can have nice wood floor when I’m 60. Haha! Before we found out about our moisture problem, I was looking at Pergo Outlast and Aquagaurd. They are supposed to have water resistant properties. Hope that helps! Don’t count on having the wood floors at 60! I thought that too and then along came grandchildren:-) We are shopping for the vinyl planks now because we have grandchildren! Haha! I’m telling my mom the same thing. We are over there all the time with the kids, and she has a pool! I would definitely like to know anything you found out about moisture in your slab. Especially if any drying out was possible. Please send me an email. Thank you! I would also be interested in learning about your moisture problem as we just purchased a home where we may have similar issues. Have you had any issues with lifting or peaking at the seams? Did you install directly over concrete or did you put an underlayment down before laying the vinyl? How about scratches–any issue with that? No, we haven’t had any issues with lifting or scratches at all. I have yet to put pads on our new kitchen chairs, and still no problems. Ours is not glued down, it’s very thick and clicks together just like laminate. We put a really nice underlayment down to help with noise and we wanted extra protection against moisture and mold. What brand, and color did you choose? Looks great! We used Paradigm’s Longboard in the color Mavericks. We are in the middle of putting on an addition and we have a big concrete slab, that I would like to cover with LVP. I’m now considering an underlayment after reading your article, and am wondering if I can find out what underlayment you used, and if you feel it really cuts down on the noise and makes it softer under foot. We hav terrazzo throughout the house and a lot of bouncing noise because of it. We live in FL, so the moisture is also something to consider. I don’t know what brand of underlayment was used as our contractor just brought it in. It had like a shiny, foil backing. You want to make sure to read the installation instructions to see if they recommend using an underlayment or not as some already have them attached. As far as noise and cushion, I never had the floor without the underlayment, so I don’t really know if it made it better or not. My contractor just said that it would. Hope that helps a little. heavy rains, we’ve had little pooling on basement floor. Looking to install Home Depots Allure ISICORE or LifeProof. Both are 100% waterproof. At odds about adding a 6 mil moisture barrier also. Your thoughts about water pooling issues could help. I can only talk about what I have experience with. Living in California my whole life, most houses don’t have basements, so I know nothing about them. When researching vinyl plank, I always read the installation and care instructions. Most will say what the moisture limits are. Even though the flooring is water proof they still have moisture limits, and I think it can still grow mold underneath. If I were you, I would find a few local flooring contractors to ask their opinions. Sorry I can’t be more help. I live in Texas and homes on concrete slabs. Much humidity here too. Love the look of LVT. But could you tell me about the moisture concerns and what to do about it. When it rains hard my yard can be a lake. Your home looks great have to see if there is a contractor that can install that brand here. Would love to know how you addressed the moisture problem with the foundation drainage problem. We are having the same issue with new construction. New construction might be a different issue of them not letting the slab dry out completely before putting on the flooring. My mom had this problem and had to get tile. LVP wasn’t an option for her back then though. Check out my post. You need to see how high your moisture levels are and that can help determine the type of floor covering you can get. I’m interested in knowing how you fixed the water problem on the foundation. Thank you for your review. I have been looking at the same flooring but am hesitant since I couldn’t find any reviews. Neither the designer nor the contractor has heard of this brand so it scares me to purchase this flooring for the entire house. If you had to do it again, would you buy it again? Yes, I’m still really happy with the flooring. I have it on our entire first floor (minus the bathroom), and I love it. I think COREtec also makes some nice ones, but I haven’t really researched them at all. That slate is beautiful. Hard to imagine tearing all that out. Also hard to imagine that the vinyl will be anywhere near as durable as the slate. Oh well, gotta keep up with the trends…and the Jones–no matter the cost and quality. It was a very poorly done tile job. All the tiles were uneven, sloppily installed, and cracked, so we decided to take them out. I would have rather saved my money, but this was definitely a better choice of flooring for us. Thanks so much for your review. I am having LVP installed at this very moment as I write this. I chose it because of the high ratings it received for durability but one thing I didn’t think about was the “dent” factor. I’m afraid that being vinyl it will get indentations from chair legs and heavy furniture. What has been your experience with that? Any problems? I can only speak for the floor that we got, but we haven’t had a problem with dents or scratches. I put felt pads under all of my chairs and stools (get ones that nail in, not sticky ones). I also put caster cups under my piano wheels to distribute the weight. The huge piano was the thing that worried me the most, but we used boards to protect the floor as we moved it in. We set it on the cups, and haven’t had a problem. I’m also being careful to not get rugs with a rubber anti-slip back. I don’t want to take the chance that it will yellow the flooring. I don’t know if that can happen, but I’m not going to chance it. I found some rug pads that said they wouldn’t turn floor yellow. So far, so good. There are many brand names for Luxury Tile- What did you use? The brand we used is called Paradigm. It’s the longboard style in the color Mavericks. Did you research Armstrong Luxe vinyl before you decided on the one you picked. I’ve read so many bad reviews but the flooring stores I’ve talked to said they don’t understand because they install tons of it with happy customers. Thank you. Yours looks lovely. I haven’t researched that one at all. I’ve heard from some people that they have problems with scratches on some of the vinyl plank. I suggest getting a sample of the one you like and try scratching it with a screwdriver or key. Haha! From what I understand, the Paradigm flooring has a lifetime warranty if it is in your home (residential) and a 10 year warranty if it is in a commercial building. So we would have the lifetime warranty in our home. When I looked at all of our other lvp samples, this product felt the most realistic to me. The people that did the installation were all commenting on what a great product I had chosen, and they were excited to install it. I recommend bringing a bunch of samples home and seeing what they look like in your house. Touch them, walk on them, and even scratch test them if it’s a sample you can keep. I’m not sure about stairs. They have a website with lots of information, so you might find an answer on there. Would like to know how you solved your moisture problem. Also any off gassing or smell. Is it fire resistant? I have asthma, have to be careful. I’m typing up a follow up post to let everyone know what our moisture problems were. That should be up in a few days. I don’t know if it is fire resistant, but you might be able to contact the manufacturer to find out. We had a lot of smells going on at the time of installation since we got new carpet as well, so I can’t tell you if the vinyl was bad. Sorry. I find this curious. Laminate flooring tries hard to look like wood and you mentioned that vinyl flooring doesn’t look like laminate. Does the vinyl flooring look like plastic? Also flooring is a dynamic part of any room and people look closely at flooring as it is part of decor. Yes, I would say it does look a little more plastic. The difference is especially apparent when you are looking at it from an angle like I showed in the one photo. You have to be looking at it in the right lighting and angle. Also, the edges where the boards meet don’t look as realistic, which you can also see in one of the photos. Most people don’t notice anything is different unless they are sitting on the floor or touch it with their hands. They usually think that it is wood-look tile, which is really popular right now anyway, but this is much cheaper to install. Your best bet will probably be to get samples of different flooring to see and feel the difference yourself. Some of the vinyl we tried looked and felt really fake. This one seemed the most realistic of the ones we looked at. Thank you so much for this! 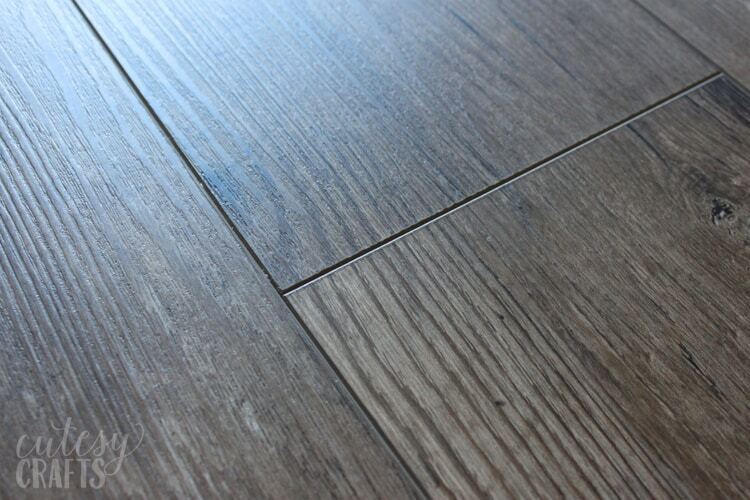 We are starting to research flooring options and were looking for a waterproof alternative for wood-look tile. We have two old dogs who have regular accidents and I myself use a wheelchair (wet wheels in rain or snow are not friends to wood! ), so in theory tile sounded great, but I don’t want my poor husband walking around on hard, cold tile and having knee/back issues. I’ll definitely be looking into LVP. So glad I could help! Good luck on your search for the perfect flooring! I don’t know. I know their website has a “technical” section, so maybe the materials would be listed there? Otherwise, your flooring dealer might be able to find out for you. Good Lord Jessica you have the patience of Job fielding all these questions and critics! Thank you for all this good info! I am in the home stretch of installing Coretec LVP. The people I hired to do the job did not have an attention to detail attitude so I let them go and am doing it solo. I thought I had done a lot of research on it and it seems pretty good from what I have heard and read so I went with it. Hope it works of for five or six years then the new owners. can do what they want. I was going to put it in the laundry room but think that idea might be out the window. I installed it as a flooring floor as when have had some earth quakes and cracks developed in the tile which were stuck right to the concrete, I know they now have a membrane that can go under tiles which makes it a floating floor. I was looking to find an answer about the laundry room and I think I have. Thanks for all the input and it was much help. Thank you for sharing your research on LVP. I have searched the web for the Paradigm site with a link to locate a local retailer but haven’t been able to find it. Do you have a website with a retailer link or a customer service contact number? Hmmmm… They used to have the information available on their site. That’s slightly concerning! When I google it, some retailers in my area pop up. Maybe you could call one and see if they have contact info for the manufacturer? 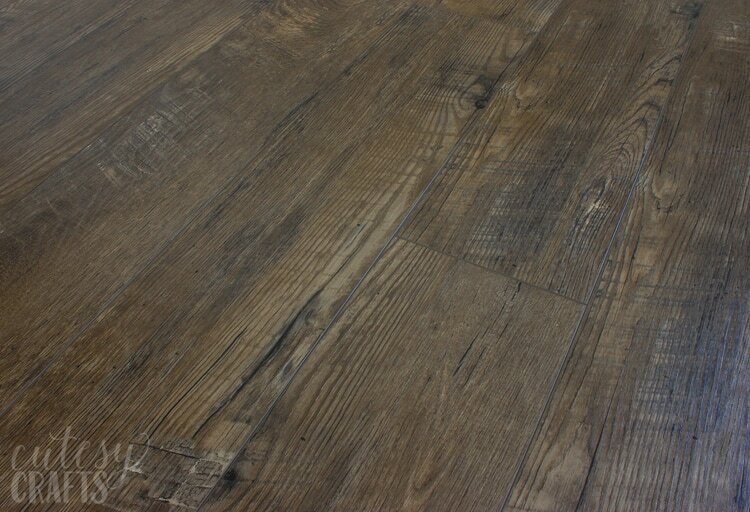 Has anyone put down Southwind’s Authentic Plank LVP? It is supposed to be very comparable to Coretec’s HD Plus, but there aren’t many reviews. Thanks! I put down a 2 pallets of Authentic Plank Finnish Pine about 1700 sqft. It’s been a year and a half. We put it to the test. Rehabbed the house after the floor was down. Did not think I was going to do such a major Reno. Anyway It looks better than when it went down. Home is for sale now and can’t believe the questions comments on this flooring by potential buyers, Folks love it! Oh no, that’s horrible to hear! I’m so sorry that you are dealing with that. Good to know the other side of things though. Hopefully reading your comment will help others make an informed decision. Mine has a coating on it as well. I think it’s the “wear layer.” I haven’t noticed any rub marks, although I have noticed a few scratches. My fault for letting my son ride his toy car around the house. I think it also helps that mine is very rustic looking, so you can’t see much on it. Thank you for taking the time to let everyone know your experience with vinyl plank. I am experiencing the same problem. I bought a 2400 square foot home and spent a lot of money replacing all of the flooring with cortec plus hd vinyl plank flooring. I have been in my house for a month and there are new scratches every day. It also always looks and feels dirty all of the time. I mop almost daily. Very disappointed and wish i had gone with laminate. I also cannot afford to replace it. That’s horrible! 🙁 Thank you for sharing your experience though. I wonder if mine doesn’t show as much because of the pattern on it or if it’s the brand? Are yours a darker color and/or more solid pattern? How is general upkeep? We just put this floor in and it is anyways covered in smudges and footprints. I mean, I mop it and within a couple hours it’s a mess again. We have kids but I’ve never seen anything like this. I’m just wondering if you have experienced anything similar because I have the flooring rep coming to look at it and I’m considering how to deal with it. I’m trying to find out if this is just the way it is and if other peoples floors always look dirty or if I can get the warranty to replace it. I have mopped mine maybe a total of five times since we got it a year ago. Haha! I think it helps that ours is a somewhat light color and looks rustic. It hides stuff. What color is yours? My sister has dark, hardwood floors and complains that they show every speck of dust and footprint. No, we took out the tile. It was very thick and super uneven. There was no way we could have left it. I’m a landlord. I’m trying to “bullet-proof” my apartments. That usually entails replacing all the carpet. I allow pets. I like tile with lifetime sealed grout. But, you can’t do that in an old building over wood floors. My concern is if the dog urinates on the floor and it doesn’t get cleaned up for 8-10 hours while the tenant is at work, will the urine permanently seep into the seams of the planks and possibly into the wood subfloor? Or, since the vinyl is floating, if the dog urinates on the wall, will it seep down and around into the subfloor? Hmmm… That’s a good question, and one that I don’t know the answer to. If I were you, I’d go talk to some local flooring retailers and see what they say. We don’t have any pets, and we have a concrete slab foundation, so it wasn’t something I was worried about. Sorry I’m not any help. Thank you for sharing all this information. I’m trying to decide between the Coretec Plus waterproof LVP vs the Paradigm product you installed. I would be interested in knowing if anyone has found a nonbiased resource that ranks these products across various categories. Also, for those looking for the Paradigm product, I live in Northern California and Conklin Brothers sells it. Thanks for that information. That would be nice to find something like that. Almost like a consumer reports for flooring. My worry with Paradigm is that their company information is not readily available. Who are you supposed to call if you have a problem? I can say, I’m still really impressed with my flooring though. I’ve had a few scratches, but my fault for letting my son ride his toy car around. They are only in the top layer, and I was able to rub them out with my fingernail. My brother in law was here today and hadn’t realized it was vinyl, so it looks great! Thank you so much for your detailed review. I am too deciding on what type of flooring to put in my house. We are getting ready to go through a major renovation. Our house is 4500 square feet, this includes a full finished basement. We have 6 dogs and 3 kids and their friends in the house all the time. We are thinking about selling our house in a few years to down size after all the boys go off the college. What experience have you had with the value of your home after you installed these floors? Thank you so much! We’ve only been here a year, so I don’t know how it will affect our value. I know appraisers value homes with laminate/hardwood higher, but I’m not sure how they will value this. It’s kind of a newer trend. Maybe you could ask a realtor or appraiser? Good luck with your decision! 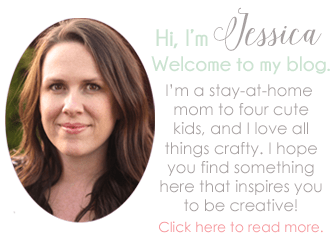 Thanks so much for your review Jessica! We’ve just entered the confusing world of floor coverings and I am looking at LVP very seriously, a similar style to yours, but one here in Australia. It was good to hear your viewpoint. We have a big clumsy staffy dog so am still unsure how her claws will go with it, but it sounds as if it’s the toughest surface available. Other than tile, it will probably be your best bet. Get some samples and scratch them up a bit to see what happens. Now that you’ve had it a while and been through some temperature cycles, have you noticed any gaps in the floor? We’re concerned about the floor planks separating over time. No problems yet! It clicks together with a tongue and groove just like laminate, so I think the joints would perform the same. Thank you for sharing your experience with LVP. We are on the process of building our own house and the builder said the floor will be laminate. I asked them if I can change it to Vinyl Planks instead. That being said, I am doing my research if Vinyl Planks really is a good flooring. It will be on my main floor, living room, kitchen and washrooms. Your experience and informations shared here helped me to decide as I am really in dilemma to what flooring is the best and less maintenance. So glad you found it helpful. I really love our floor! Just make sure you pick out a good one. A couple people have commented about experiences they’ve had that aren’t the best. What color is that on the walls? It’s “Tombstone Gray” from Kelly Moore. It looks gray in some areas of the house, and more beige in others. Just make sure to paint it in different lighted areas to see if you like it. I recently installed Paradigm longboard in my new house over the concrete slab. Floor looks beautiful but after a few weeks I started developing squeaks at the seams. Slab was well cured and very level. At this point I am waiting for manufacturer to examine the product and determine what the problem is. The installation appears to have been done very well and the installer has never had this problem in the past. Interest to know if anyone has had this problem with vinyl plank flooring. Oh no, that’s horrible! We haven’t had any squeaks at all, and we’ve had it for over a year. Hopefully you get some answers. So happy you made this review!! I have looked all over for reviews or even pictures of the Paradigm Longboard installed, but had no luck until I saw yours. I almost went with Mavericks but instead went with Pipeline. I even ordered samples of both because they were so hard to pick between the two. They are both very nice. Im having a house built now and having the LVP put in the entire house but the bedrooms and stairs. I am even having it installed in my bathrooms. Very excited to see how it turns out. Thanks again for the review. I may do the same and make a review as well to help people with their decisions. That’s exactly why I wrote this post! So hard to find photos and reviews. The Pipeline does look very similar. I hope you love yours as much as I love mine! I’d love to see your review if you write one. Please read and ask for the MSDS on these products from retailers.They are very toxic and you should avoid them. 90% of these products are also made in China. Luxury Vinyl Plank is made from PVC (poly vinyl chloride) which contains plastisizers to increase flexibility,plastisizers cannot bond with PVC so they migrate from the PVC. The plastisizers contain Phalates which are endocrine disrupters in the human body. Please do your own research before you put this in your home. Thank you for this information. From what I am reading, it says there are some that aren’t made that way. Will most flooring retailers have an MSDS on file, or will I need to contact the manufacturer? I curious to know what is in ours now and if anything can be done after we already purchased and installed it. Paradigm products are othro-phthalate free and made with 100% virgin vinyl. This means harmful chemicals, heavy metals and other potentially hazardous content are not recycled into your floors. They are PVC free, VOC free, Carb 2 compliant and they are floor score certified. So you are good to go. FloorScore is a voluntary testing program that certifies that hard surface floors are in compliance with stringent indoor air quality emissions. The program was developed by the Resilient Floor Covering Institute (RFCI) along with Scientific Certification Systems (SYS) to test and certify flooring products for compliance with indoor air quality emission requirements adopted by the state of California to ensure that it safe for you and your family and even pets. I have 1 correction. I meant Pthalate free not PVC free. The rest I got from the retailers. Ok John, here’s the answer I got. There is PVC in Paradigm products. There’s maybe one company who has products that are PVC free and they are actually having issues with stability. Armstrong and Paradigm and other big brands have been working on that possibility for a while, but nothing has been rolled out because PVC adds stability and without it the product does not perform. That does help! Thank you so much for taking the time to comment with that information. Makes me feel much better! Nice review! We are considering the Coretec Plus Enhanced LV tile which has the bevels in it like your’s does. The bevel on the color we are looking at (Lyra) is a fairly light color. Our concern is that those bevels are going to collect dirt and be hard to clean. What is your experience so far with those bevels? Any problems with dirt accumulating? Thanks! I was worried about that too. I use a vacuum to sweep my floors, so it hasn’t been an issue so far. Sometimes sticky stuff in the kitchen can be a problem, but that comes out with the mop for the most part. I haven’t had to get down on my hands and knees to pick stuff out of the cracks or anything. I was on the fence with this and read a review where someone had a bunch of bowed plants from the getgo and manufacturer was ignoring them when they tried to resolve. Also read that vinyl pack flooring in general is likely to release at least some amount of VOCs. Definitely going to go in a different direction now with flooring options. Oh that’s awful! Nice to hear a different perspective. Luckily we only had a problem with a couple of planks, and those were minor. Just some issues with the design on the top. My installer’s fault for not checking each plank as they installed them. The manufacturer sent another box free of charge in case we ever decide to replace them. Thanks for the great and informative review! I have a similar moisture problem in my concrete foundation due to a slab leak. We resolved the leak by repiping the house, but the moisture testing company is now recommending we shot blast and seal all the concrete. Where did you find the specs on the LVP moisture tolerance? You stated the Paradigm Mavericks LVP you used can handle up to 9lbs/1000SF, which is perfect for me since the highest reading on the test was about 8.6lbs, and that testing was completed when the leak was still fresh. I checked all the technical specs on Paradigm’s website but didn’t find anything. It would be awesome if I could avoid spending thousands on the sealing. Thanks! They don’t have the installation instructions on their site anymore, for some reason. I saved them for myself though. Don’t ask the moisture testing company for advice. They will try to rip you off. Ask a few flooring installers to get different opinions. According to the manufacturer, you should be okay with this flooring anyway though. Send me an email at cutesycrafts at hotmail if you would like me to email you the entire installation instructions. Thanks so much for posting this. I’ve been tossing around flooring in my head since buying the place I’m in. I did have laminate installed in my last house, and a couple of years later, water stains and leaks showed in too obvious of places. I thought of wood and tile, although I already have 18″ tiles in already, and they’re newer, but the carpet is a bizarre blue That I must replace! I’m going on sixty three, so major projects are too much for me anymore. I use what strength and agility I have left on my classic car and hot rod build. Let the younger guys stay bent over all day! Back to my original point, this was very helpful and informative, again, thanks! Glad I could help! The only place I don’t have it is the bathrooms so I can use chemicals in there without worrying. I love not having transitions. I’m so impressed that you rebuilt a car! I keep trying to talk my husband into getting a useful hobby like that. Haha! Good luck making your decision! This is such a helpful review — I so appreciate your hands on advise about what you went through to end up picking LVT. We are just starting the selection process due to a water heater flooding part of our home. I was wondering, do you have any additional thoughts after living with the LVT product for a year?And, would you choose it again (Or do you wish you would have picked a different product in hindsight)? I think we have narrowed it down to wood like tile from Dalltile or LVT. I still love it and would definitely choose it again. We are thinking about moving again, and I keep thinking that I don’t want to leave my floor. Haha! We were looking at tile as well, but couldn’t swing the installation costs. Read through the comments here though because some people have had some issues with whatever kind they purchased. Take home samples, step on them, get them dirty, and try to scratch them before deciding. Good luck! Thank you for this, it was super helpful! I a, really struggling to pick a LVP because I just love bamboo so much. The Heart wants what the heart wants but I’m going to have to let my husband win this one I think. Off topic, can you tell me your paint color in your foyer? I love it! We’re painting too LOL. Glad I could help! The floor we had previously, that discolored, was bamboo. Flooring contractors did not have nice things to say about it, but it was also from 16 years ago. The paint is Tombstone Gray from Kelly Moore. My friend had it in her house, and I loved it. Looks more beige in the sun and gray in the shade. The white she used was Swiss Coffee from Kelly Moore, and I love that in her house too. We decided not to redo our white. 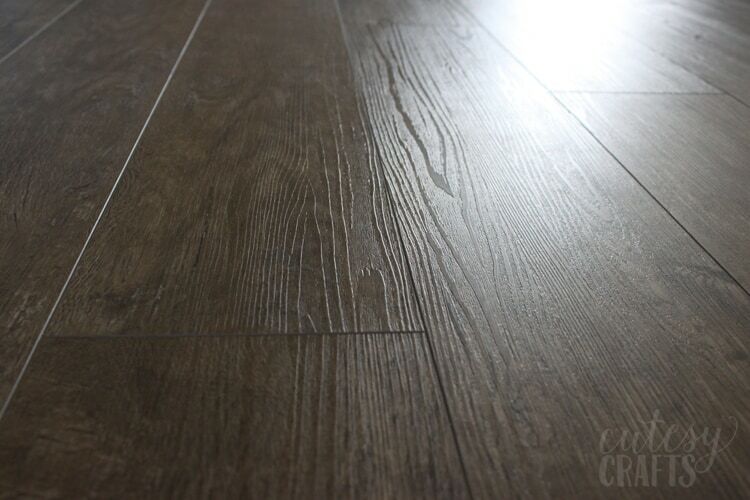 Has anyone had Cali Bamboo LVP flooring? I’ve looked for unbiased reviews on it, but everything seems to be about their bamboo floors or decking materials. What I have found on the LVP seems to be from sites sponsored by Cali Bamboo. I’m also looking at Stainmaster Pet Protect and some of the CORETec products.Cali Bamboo has the lighter colors I am looking for since our house tends to be dark. Any experiences with any of these three flooring products would be greatly appreciated. Many thanks to you, Jessica, for sharing all this info. Thanks for your post. Have you noticed any fading under Windows? No, nothing so far. Not sure, but I think the main concern there would be if you had direct light coming in. The way our house faces, the windows don’t get a lot of direct light, and I try to close the blinds when they do. Instead of possibly paying more for LVP that stands up to moisture I’m willing to bet that an underlayment of thick plastic on a ground floor of concrete will get rid of any moisture problems. From what I was told, underlayment also can only handle a certain amount of moisture. It’s always used in installation on a concrete slab, but the laminate manufacturers still require that your moisture levels be below a certain point for warranty. I’m not sure how it all works, but I didn’t want to take any chances. That would have been nice to spend less money, but I do like the other properties of this flooring too. Did you have any underlayment added? I’m curious if it’s noisy when someone walks on it or how hard the floor will feel. I know it has a pad attached, which should suffice. I am having mine installed soon over concrete slab. Thank you for your helpful review! Yes, my installer recommended an underlayment for sound reduction and extra moisture resistance. He used a nice, foil-backed one. Make sure to read the installation instructions of your particular flooring to see if it is recommended and how thick of one you should choose. You don’t want too much padding or it could cause problems. Very helpful information and advice. I am replacing flooring in my home and I have honey oak cabinets like yours…how does it look with the honey oak? My cabinets are a little lighter than the traditional honey oak. I think they are closer to a yellow-y pine. Still not great. Haha! They look okay with the floor. I’d eventually like to get them painted white, but we’ll see if that ever happens. I just took some pics of my house because I want to do a post showing what the whole place looks like. It’s not up yet, but I can send you a pic of my kitchen. Just email me at cutesycrafts at hotmail. We are looking into Paradigm flooring and I stumbled upon your post. We are struggling to decide on a color. I actually returned to the store to grab a Maverick sample after seeing your blog. Our sample looks much lighter than your whole room pictures. We were kind of wondering if it appears darker when viewing the room as a whole. Is there anyway you would be willing to send me some more pictures of your flooring?😬 We haven’t been able to find photos of any of the paradigm products in actual rooms ( except for yours😉). Hello, I wrote a comment a few weeks back, but I don’t see it posted here. I was hoping to see some whole room pictures of the Paradigm long board Maverick coloring. We need to make a decision very quickly and Maverick is one of the two colors we’re trying to chose between. Hi, sorry. My kids are out of school for Christmas break, so I haven’t had much time to be on here. I can take some cell phone photos and send them to you. The lighting here isn’t great today. It’s cloudy and rainy for the next couple days. The sun should be out by Wednesday. I can take them now or wait. Send me an email at cutesycrafts@hotmail.com. We moved to Tucson AZ after over thirty years loving and living in Hawaii. 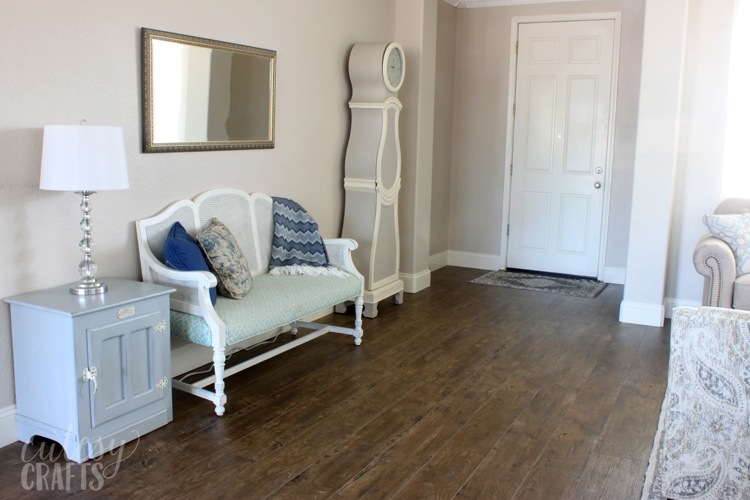 We love engineered wood floors so we selected Provenza flooring installed. Unfortunately, the wood planks were split coming out of the box as the humidity is low. Runs 30% in the great room and 28% in the bedrooms. The floors are being removed and they have recommended Paradigm Water Proof Flooring. Will LVF do well in low humidity climates? That’s something you will have to ask a flooring expert about as I don’t have experience with different humidity levels. I in the Sacramento Valley in California if that helps at all. Not sure what the differences are in humidity. Sorry. Thanks for these reviews! We are out of our home right now because flooding from a token pipe ruined flooring in several rooms. Starting to think of replacements. We have a parrot and two budgies, and rolling the parrot’s big cage over laminate floors over the past years has taken a minor toll on them. Our contractor suggested LVP as a good and less expensive option. I’ll be looking into whether that’s because prices have come down, or if that’s because installation is less. Anyway, thanks for your thoughtful writing about this! You’re welcome! Glad it was useful. I would probably try to find something to put under the parrot cage wheels. I know some vinyl has more tendency to scratch than others. Good luck with your search for new flooring! We had the premium engineered vinyl flooring installed in our basement over concrete. We like the wok look but are concerned about he floaty boggy feel we walk over some areas. Is this normal? Ooh, I haven’t noticed anything like you are describing with mine. It feels the same anywhere that I walk. It might be because it’s a different brand or maybe the installation was done differently? Might be worth asking a different flooring contractor their opinion.